Finding simple May Day basket ideas makes it easy to celebrate this fun springtime holiday. Children of all ages enjoy creating colorful baskets to share with their family and friends. Make special memories by reserving a day to create baskets with your children. Around the world, May 1 is known as May Day. This is a simple holiday devoted to celebrating the joy of spring turning into summer. It is related to the Celtic celebration of Beltane and the German celebration of Walpurgis Night, but is now more of a secular holiday than a pagan religious festival. Rituals for celebrating May Day are different in each country. In France, for example, people have a parade with cows that have flowers attached to their tails. Trying to touch a cow in the parade is supposed to bring you good luck. In London, children bring flowers to their neighbors and get pennies to throw in a wishing well. The pennies are later donated to charity. In Germany, children celebrate May Day by dancing around a large Maypole that is elaborately wrapped with colored ribbons. In the United States, one of the most popular May Day traditions involves giving May Day baskets to family and friends. The baskets can be filled with flowers, candy, or small gifts, depending upon your budget and the tastes of the basket recipient. 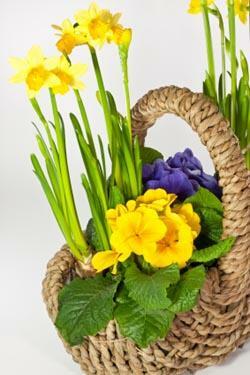 May Day baskets are traditionally tired to a door knob or placed on the doorstep. The basket giver rings the bell and then tries to dash away without being caught. If you catch someone who is giving you a May Day basket, you are supposed to give them a kiss. Cover an empty tissue box with wrapping paper. Paint a terra cotta flower pot with acrylic craft paint. Paste pretty patterned scrapbook paper around clean tin cans. Tie a ribbon around the top of an empty glass jar. Weave ribbon or yarn through the slots in an empty plastic berry basket. Use crayons, markers, and stickers to decorate a paper cup. Fold a simple origami basket. Cut a large half circle shape from a sheet of sturdy cardstock, roll it into a cone, tape it together, and then add a ribbon hanger. Kaboose has several fun ideas for May Day crafts, including a basket made from a paper plate and tips for recycling old play dough containers into clever May Day baskets. Family Fun has a step-by-step tutorial for making a May Day basket that looks like a friendly honeybee. If you're planning on making multiple May Day baskets to distribute to friends and family, keep in mind that the most cost-effective way to complete this project will be to buy supplies in bulk and make your basket fillers in an "assembly line" fashion. Look for sales on craft supplies and small toys at your local dollar or discount store.